This giveaway is now CLOSED. Thanks so much to our wonderful sponsor Dove (and our friends at RocketXL)! We look forward to working with you again! The winner is Louis! Remember: There are great giveaways active on the upper right hand side of the page! When there’s no place he would rather be than a princess tea with his daughter – donning a tiara and all – or when little league outranks the major leagues! - Now that's a MAN! Did you enjoy the Dove commercial during the Superbowl? Ƹ̵̡Ӝ̵̨̄Ʒ - WIN IT! 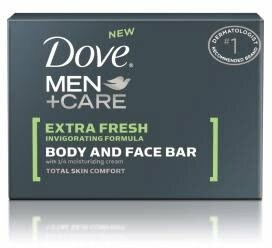 - Ascending Butterfly and our friends at Dove Men + Care and RocketXL would like to provide one lucky winner with the opportunity to win a Dove Men + Care Body and Face Bar in the Extra Fresh - Invigorating Formula! Don't you just ♥ Dove? I know I do! Ƹ̵̡Ӝ̵̨̄Ʒ - How to Win: (1) You must be a PUBLIC follower of Ascending Butterfly to be eligible for this and all giveaways. Indicate in your entry that you follow (if your 'comment name/user id' differs from your profile id, please let me know what name you follow under) and (2) Tell us What moment revealed his confidence? Guys, what moment revealed your confidence? If you are a lady winning for your dad, son, brother, uncle, grandpa or male friend, tell us about him and what moment revealed his confidence. (3) You must also leave your email address somewhere in your comment. (You can format it this way for security, example: ascendingbutterfly AT mail host DOT com, If your email is visible in your profile, just say so, that's OK! Even if you are a subscriber, if your profile is set to private and you don't include an email we have to disqaulify your entry. Please follow the easy 1, 2, 3 steps to winning! This giveaway is open to USA AND Canada residents who are 18 years of age or older and have a facebook page. No P.O. Boxes! FTC Disclosure Info for this Giveaway: This is not a paid insertion. This is a non-compensated post and all opinions regarding the products are expressly my own experiences. I was provided product to review (in conjunction with RocketXL) and for the giveaway. The sponsor is fulfilling directly to prize winner, this in no way influenced my opinion of the product. Once a winner is selected and their information has been forwarded to the sponsor, the responsibility of prize fulfillment rests with the sponsor. I follow and I think when the neighborhood men started coming to my husband for various tools and equipment from our garage. Follower and trying to win for my sons. The moment he got confidence was when he became a member of the church and decided to go on his own. Everytime my husband gets on stage to play his guitar and sing he shows his confidence. Thanks for a great giveaway! He showed his confidence when he finally asked me out. We were acquaintances for three years and he was sooooo shy; then he asked me out and we were married 5 months later. I showed my confidence when I finally asked her out. What revealed my husband's confidence? He makes a decision and goes with it. He maintains a confidence that he intellectually thought whatever out and goes forward. He also will change as circumstances change. That is a confident person. Grabbed your button and put it on my blog. When he helped me through a very hard period of time in my life. I'm a follower and my husbands confidence was revealed when he replaced our ceiling fan with a new one. My husband showed his confidence when he left a bad marriage and became a single father of 3, one with a serious illness. He is so strong and capable and works hard to support his family. Email address visible in my profile and I follow via GFC.